What’s the most expensive part of your marketing automation system? It might be. . .the SEND button. It’s easy to get so caught up in the excitement of the technology—all that we can do, and how easy it is to do it—that we lose sight of the fact that email is not free. Using email to reach customers has a cost to it that goes beyond what we pay for systems, solutions, connectivity and all that fun technology: we have to consider the intangible costs as well when we evaluate our email programs. Sometimes hitting that SEND button can be a lot more expensive than it seems. Here’s what I mean. Recently I worked with a company that was still doing “batch and blast” with a send-to-all mentality: no targeting, no message tailoring, and essentially the instant gratification “we have to sell 200 more by Friday” kind of offers. The marketing team discovered that not only does this approach waste a lot of potential opportunity, it also makes it very easy to mess up the sales process! Without going into too much detail, let’s just say that sending the wrong message, at the wrong time, to a prospect who is just about ready to sign on the dotted line, can be a very expensive mistake to make. It’s impossible to overstate the importance of customizing your message for the audience: just remember the old saying, “You only have one chance to make a first impression.” In marketing, the ability to customize messaging comes down to segmentation. You may be afraid that segmentation means hiring expensive consultants to spend months combing and analyzing your database. If you have the budget for that, it’s great! But many organizations don’t, and as a result, they don’t even try. An “entry-level” approach to segmentation involves widening the net in your messaging. For example, offer links to different areas of content and monitor what content is consumed. A newsletter is a great tool for that approach as you can offer a variety of different kinds of content. Another way is a survey-based nurture that asks prospects to self-select areas of interest in order to receive valuable content. Other options can work too; it really depends on your business and your prospect base. Once you’ve begun to collect segmentation data, feed these prospects into targeted email campaigns based upon their activity. For organizations that don’t have segmentation in their databases yet, this is the way to start: simply by tracking and placing prospects into groups based on activity. Recent and upcoming innovations from Eloqua and Marketo are making it easier for marketers to obtain segmentation data and use it to make your marketing more effective. For example, Marketo just launched a new nurture feature to monitor what prospects are receiving during the buying cycle and how they are moving along the path. At DemandGen we have built some Eloqua solutions that use automatic data collection to enable dynamic content delivery. Test, test, test! It’s the only way to learn what works—and to get your content and your execution right the first time. 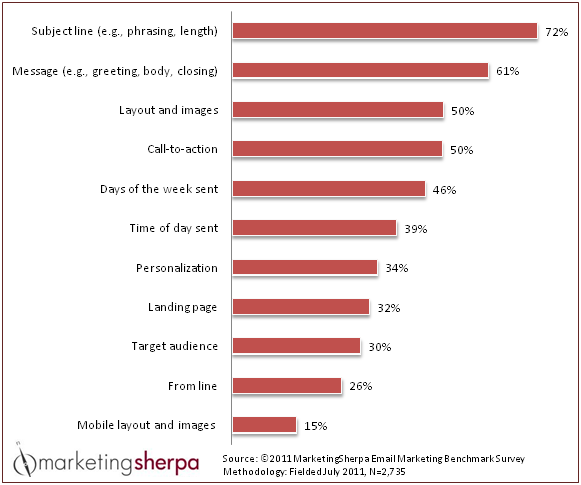 A MarketingSherpa survey revealed what elements of campaigns marketers are most commonly testing. You don’t have to test everything: good choices for testing are subject lines, images, headers, and link copy. Ultimately, you’ll derive higher true value from your campaigns when you have a solid understanding of what generates response from your prospects. Clicking that SEND button is so easy that we sometimes forget the huge reach it has. Your email carries the brand of your company, so poor grammar, typos, wrong links and other kinds of errors don’t look good for your company–let alone for conversion. And unlike a printed brochure, an email can be forwarded to millions and posted on Facebook! It’s a simple formula: mistakes = embarrassment = cost. Don’t skimp on the QA. Make sure your testing protocols include mobile as well as various email clients. Testing on mobile devices is hugely important today. A study by Yesmail Interactive last month found that consumers open almost half (49 percent) of all brand emails on a mobile device; 61 percent of consumers now read at least some of their emails on a mobile device, with 30 percent reading email exclusively on mobile devices. Be sure to check email rendering on the most common devices like leading smartphones and tablets. Because all email clients display email differently, it’s critical to test your emails on as many platforms as possible—especially each time you use a new or altered template, or a new kind of content. Yahoo, Gmail, and Microsoft Outlook all render emails very differently. In addition to any rendering problems, also check to ensure the first visual readers notice is the right one for your purpose: is something else drawing attention from your main message? Are your links obvious enough? Do the key points come across clearly and “above the fold”? Don’t forget to check the text versions as well. Optional tools are available in Eloqua, Marketo, and other online services that you can use for testing. Another approach—a bit more manual, but cost-effective— is to set up dummy accounts in the various email clients, include those contacts in your test lists, and view test emails in those accounts on a variety of devices. Do you really know how many emails a given contact is receiving from your company? Multiple departments like customer service, accounting, technical support, and even individual sales reps may be sending out communications every day. At the same time, your prospect may fill out forms and be added to automated campaigns. How many touches is this person getting, from how many different sources? Flooding customer mailboxes is bad business. Think of your own feeling when you suddenly start getting 2-3 emails a day from a company, or you get a sales message when you’ve just purchased; you’re bound to get annoyed! To address this risk, many DemandGen clients use communications calendars in their organizations to schedule and track outbound email. Some find that it works well to set specific days for certain communications: Monday is newsletter day, Tuesday is support ticket day. Of course, urgent things come up; if a product update needs to happen tomorrow, you can look at the calendar and see that you were going to send out this new campaign, so you can choose to hold that for a day or two. When you have the facts, you can be flexible. When you are creating new programs, take into consideration what else is going on for that audience. For example, if someone gets into your new “Campaign D,” you might want to pause campaigns A, B, and C that are going out to that person, exclude the prospect from some future campaign, or take some other action. Remember the old saying, “A stitch in time saves nine”? In marketing automation, taking the time for these few “stitches” can keep you from ripping a big expensive hole in your pipeline. Making these simple steps part of your everyday email routine will help you get the greatest value—at the lowest risk and cost—out of your email marketing campaigns. Carolyn Acker is a marketing operations and customer experience management professional. As a DemandGen Account Manager, she assists clients with optimizing marketing automation programs, with emphasis on customer loyalty/engagement strategies, business analysis, process development, and project management.